Nigeria should not wait until things degenerate to how they were in that ancient city before we act. We can learn from Samaria how they came out of the siege. The political and economic gatekeepers of our nation must connect to the thought and intelligence that will cause them to start taking ground-breaking steps that will not only reverse the current economic trend, but will lead to a never-ending season of economic boom and prosperity. Things can get better. This past Sunday I received a WhatsApp broadcast from one of my contacts that got me really thinking. It read: “Some days ago in Ilesa, a mother of six exchanged one of her children, the most senior for a basket of garri in the most tragic manner. She traveled a long distance from her home to another part of the town to buy garri, and after turning the product into her bucket, she pretended she left the money at home. She pleaded with the garri seller to allow her rush home to bring the money. She left with the garri and left her daughter behind as collateral. Long waiting turned into frustration for the seller”. Long story short, the Police were informed, the girl led the seller and the police to their house, they met her mother and five siblings feeding on the garri. Without question, her excuse was that they had not eaten anything for days and since she couldn’t watch her children die of hunger, she had to trick the seller to get the garri, since she knew the daughter left behind would eventually lead them to her home when prodded in only a matter of time. She even pleaded with the officers to allow the daughter who brought them home to join in the meal because she had not eaten for days. The police officer and the garri seller left the place weeping without any arrest or even asking for payment for the garri. This story might be true or fictitious, but one fact that cannot be contested is that people are hungry in Nigeria. Before now, the unemployment rate was very high and it is even getting worse. Today the employed are getting sacked en masse and the ones who are lucky to have a job are not getting paid. The prices of goods and services are skyrocketing. The costs of food and drinks are becoming astronomical. These are days of real hunger for the everyday Nigerian. The cost of doing business for the everyday self-employed Nigerian is on the increase daily. Barbers, taxi drivers, vulcanisers and bricklayers depend on petrol for their businesses. With the price of petrol doubling, their costs have doubled in many instances. We all know that the average worker spends more than 25 percent of her income on transportation; this too is headed north as the quality of living heads south. Small and medium scale enterprises are closing shops. Traders are complaining of low patronage… The economic crunch is setting in gradually, people are living off their savings, some are at the mercy of family and friends, while others are willing to exchange anything for any meal to keep body and soul together. The crime rate is on the rise. The situation we are in is what an economist friend of mine called stagflation. We are at that point in our economy where we have persistent high inflation combined with very high unemployment and stagnant, if not declining, demand for goods and services. Demand is stagnant because majority of the people are not earning and government is not spending. This administration took off on a very funny economic note. The militant implementation of the Treasury Single Account policy left most commercial banks without much liquidity. We know that the economy was bleeding because of corruption, instead of stopping the bleeding, by blocking leakages, government instead started draining the economy of blood for safe-keeping in a blood bank; who does not know that money is the life blood of the economy? The fact that this was counterproductive was manifested by the recent sack of about 2,500 bankers by three of these banks. The banks are not finding things easy. Government cannot withdraw all the monies of all ministries, agencies and parastatals from the banks and expect the banks and the economy not to feel the impact. The bottomline in all of these is that various economic policies of this government in the immediate are impacting negatively on the rich and poor, but more on the poor. Small and medium scale enterprises are closing shops. Traders are complaining of low patronage. Airlines are seeing fewer passengers. The economic crunch is setting in gradually, people are living off their savings, some are at the mercy of family and friends, while others are willing to exchange anything for any meal to keep body and soul together. The crime rate is on the rise. Food, we all know, is the number one human need. Hunger, they say, makes a thief of a man. Hunger makes man angry and ultimately “hangry”. Hanger is when lack of food causes a negative change in a person’s emotional state. Hunger can negatively impact on a person’s capacity to process issues and take decisions. The government should take the hunger issue very seriously. 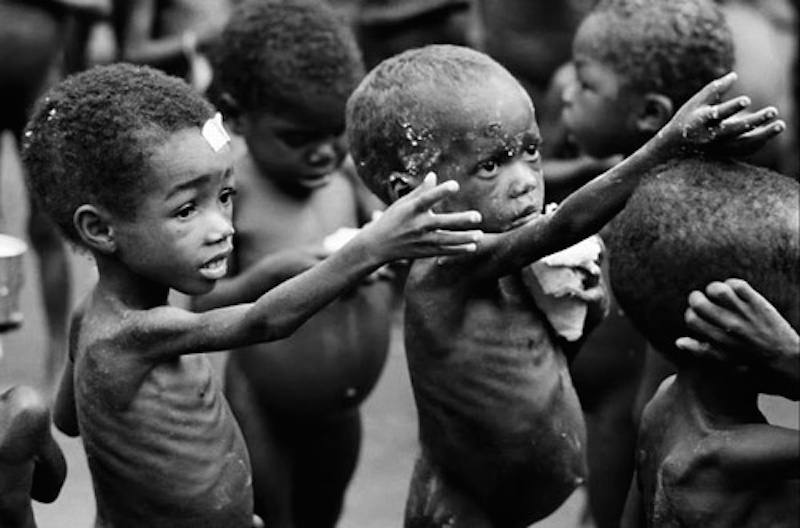 It is our prayers that the hungry have food to eat; else soon they will have nothing to eat but the rich. For the way things are, we are on turbo speed on the road to Samaria. The woman in Ilesha, who ‘traded’ her child for garri brings to mind the story of two women in Samaria in the days of Elisha, when the Syrians launched a siege on the city that brought on a terrible famine. The famine was so bad that food prices soared astronomically and the head of a donkey sold for eighty pieces of silver (bearing in mind that Judas sold Jesus for thirty pieces of silver hundreds of years later). Food was no longer affordable. The story of the women of Samaria was more pathetic than what happened in Ilesa, because in the latter the woman did not eat up any of her children, unlike what happened to the women in the former. According to the biblical account, one day the King was walking along the city wall, and a woman of the city cried out to him for help and told him the story of how another woman came to her and said “Give your son, that we may eat him today, and we will eat my son tomorrow”. So they boiled her son, and did eat him, and she said unto her on the next day, “Give your son that we may eat him, and she hath hid her son”. The hunger was so terrible that the people turned cannibals. This was the event that spurred the king to action. Nigeria should not wait until things degenerate to how they were in that ancient city before we act. We can learn from Samaria how they came out of the siege. The political and economic gatekeepers of our nation must connect to the thought and intelligence that will cause them to start taking ground-breaking steps that will not only reverse the current economic trend, but will lead to a never-ending season of economic boom and prosperity. Things can get better. Bread can become affordable. Government must do everything to check hunger. Hunger does not discriminate. Hunger does not know tribe, tongue, creed or race. No matter how much food a man eats today, tomorrow he will be hungry. The government should take the hunger issue very seriously. It is our prayers that the hungry have food to eat; else soon they will have nothing to eat but the rich. For the way things are, we are on turbo speed on the road to Samaria. Sunday Ogidigbo is the Pastor of Holyhill Church, Abuja. You can connect with him on Twitter @SOgidigbo, visit www.sogidigbo.com or send him an e-mail at psun@holyhillchurch.org.